Our Pastor at Tilly Swamp is Brother Scott Altman. He has been in ministry for just a few years and loves the Lord and the people here at Tilly Swamp. He is a native not only of South Carolina but also of Tilly Swamp Baptist Church. He has served as a Sunday School teacher, deacon, assistant pastor, and now as pastor. He knows the people and loves them. He graduated from Liberty University in 2012 with a bachelor's degree in religion and earned a masters of theology in 2017. He desires to continue to grow in the knowledge of God's word and is taking classes on a regular basis. He has been married to his wife Deana since 1990 and has two daughters, Sidney and Savanna. Greetings in the name of the Lord Jesus! My name is Aaron Hurley, and I am the pastor of youth, children, and worship here at Tilly Swamp Baptist! 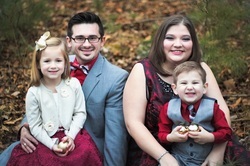 My wife Kimberly and I have recently relocated here from Ohio, and have been serving in youth, children, and family ministry for over a decade. I graduated from Boyce College at the Southern Baptist Theological Seminary in 2009 with a Bachelor's degree in Biblical/Theological studies with a concentration in youth and family ministries. We are so excited to see what God has in store in this new season of ministry! We are so thankful for our new church family, and we covet your prayers and support as we charge forward working for the Lord to reach children and youth here in Conway! children. She grew up in the Tilly Swamp community and enjoys spending time with her family. She works hard at keeping things running smoothly for the church and the pastor. She is a graduate of Coastal Carolina University.